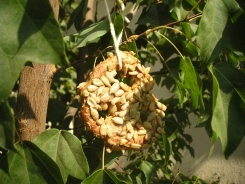 This Easy Pretzel Birdfeeder is an easy birdfeeder to create for any age. Have some extra 'ingredients', kids may be tempted to taste test their feeder while making it! 2. Pour the seeds into a paper plate and press your pretzel into the seed to coat it. 3. Thread your yarn through the pretzel and hang it in your favorite tree. If you want to make 2 or more of these pretzels you can separate them by stringing cheerios onto your yarn! Click here to find more Birdfeeder Crafts like the Easy Pretzel Birdfeeder!